NVIDIA pulled a rabbit out of its proverbial hat late last week, with the surprise announcement of the gaming-worthy Volta-based Titan V graphics card. The Titan V is another one in a flurry of Titan cards from NVIDIA as of late, and while the healthiness of NVIDIA's nomenclature scheme can be put to the sword, the Titan V's performance really can't. 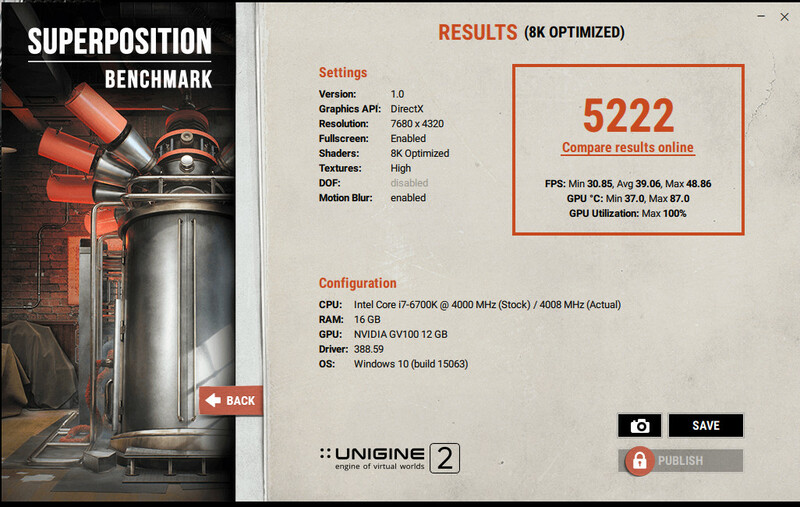 In the Unigine Superposition benchmark, the $3000 Titan V managed to deliver 5,222 points in the 8K Optimized preset, and 9,431 points on the 1080p Extreme preset. 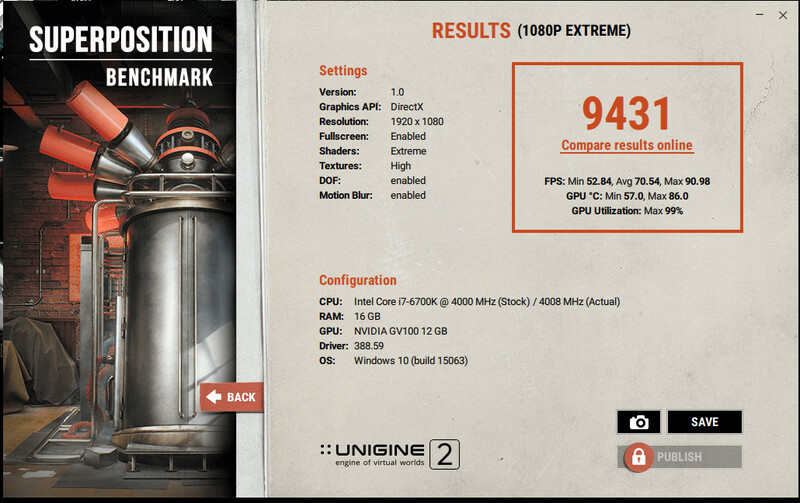 Compare that to an extremely overclocked GTX 1080 Ti running at 2,581 MHz under liquid nitrogen, which hit 8,642 points in the 1080p Extreme preset, and the raw power of NVIDIA's Volta hardware is easily identified. 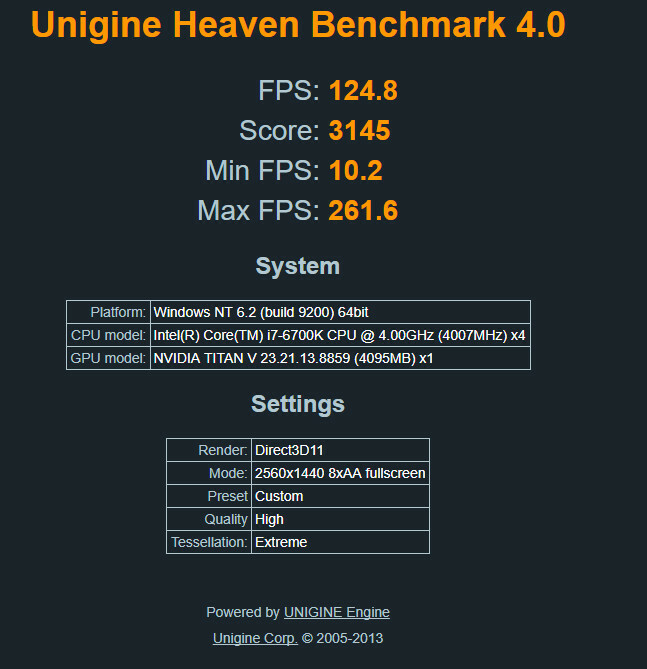 An average 126 FPS is also delivered by the Titan V in the Unigine Heaven benchmark, at 1440p as well. Under gaming workloads, the Titan V is reported to achieve from between 26% and 87% improvements in raw performance, which isn't too shabby, now is it? Poring through a Reddit discussion on the Titan V's prowess, the amount of benchmarks already in the wild is overwhelming, but a clear picture is easy to get: the Titan V is the world's most powerful gaming card at the moment, delivering a better experience in every setting, game, and workload (be it VR gaming or rendering) than any other GPU. 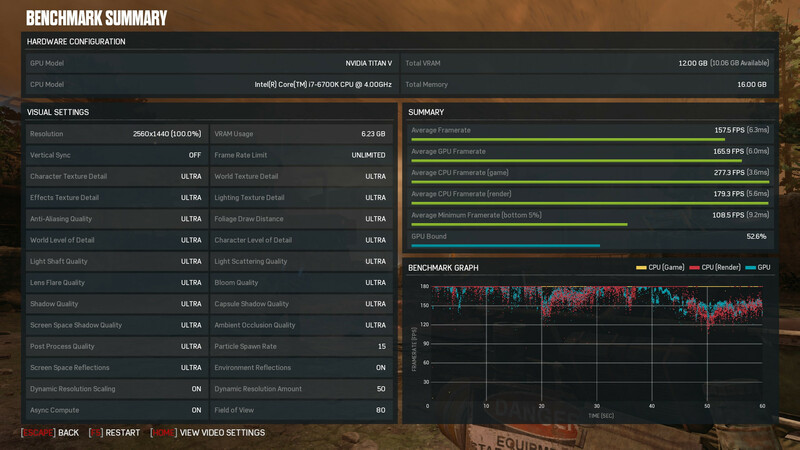 The Titan V achieves an average of 65 FPS on max settings at 1440p; an average of 157 FPS on Gears of War 4 on Ultra settings at the same resolution; 76 FPS Average on 1440p, Crazy Preset of the Ashes of The Singularity Benchmark; and a slew of other gaming results that you'd do better in poring through yourself, including Deus Ex: mankind Divided, Fallout 4, XCOM 2, and others. We also have to remember that the Titan V can either be seen as the most expensive gaming graphics card that NVIDIA has ever sold, or as the best price/performance Volta-based computing graphics card. In general compute workloads the Titan V shines again, eking out victory after victory against NVIDIA's other gaming-capable offerings such as the GTX 1080 Ti. 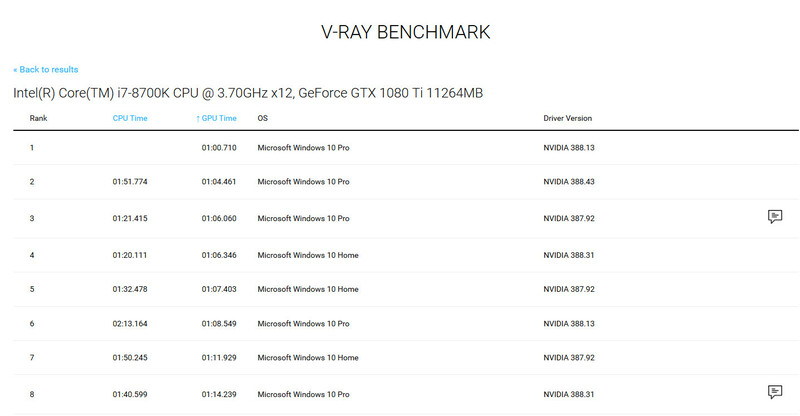 This is by no means an extensive coverage, but the Titan V has been benchmarked as delivering 41 seconds GPU time in the V-Ray benchmark, against the 107 seconds that a GTX 1080 Ti managed to deliver (with an equivalent CPU score). On SpecViewPerf 12.1, the Titan V delivers better performance than NVIDIA's professional Quadro P6000 (which goes for $5,000) across all workloads save one. This seems to be the best price-performance ratio for this graphics card, not gaming; so if you're looking for the best possible compute performance and the best gaming experience on the side, the Titan Volta is the only solution. The performance difference actually is not that impressive if we go back and see 980Ti vs 1080Ti. I mean here we have the full power of Volta and not some cut-down chip. When **80/**80Ti comes out the gap will be even smaller. It's still impressive chip for scientific calculations tho. If there's a storm could in there, it's the AotS score. Since this doesn't beat the 1080Ti as conclusively, it could be a sign that Nvidia still uses their hybrid approach to async compute. 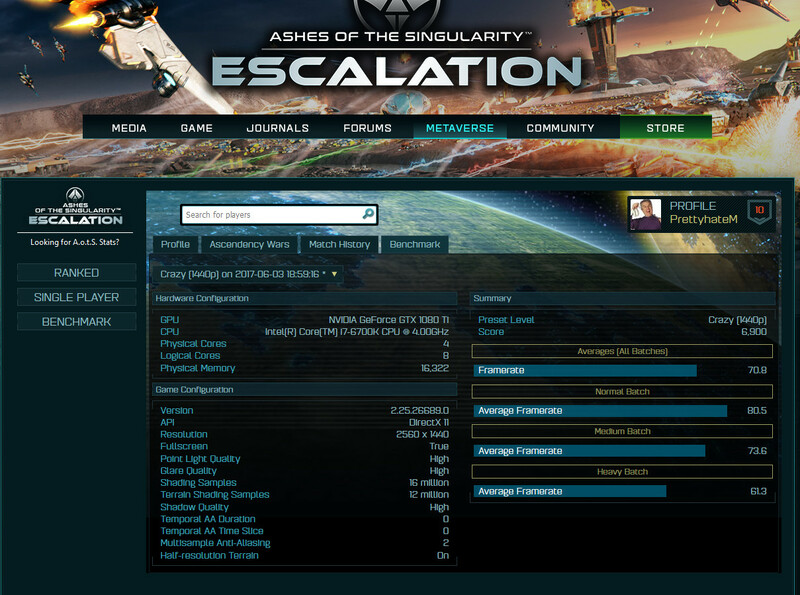 It's not certain (AotS may simply be tailored around AMD's hardware for example), but I think it's possible. 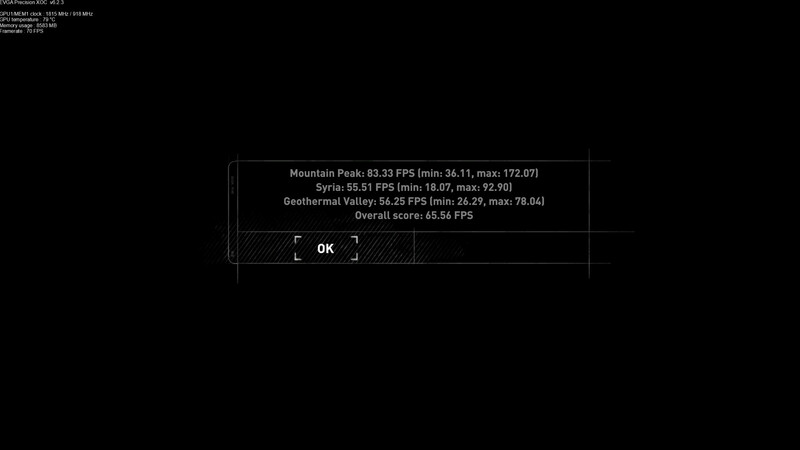 GOW score is about 25% over what 1080Ti can achieve and screenshots seem to show it is considerably more CPU-limited. 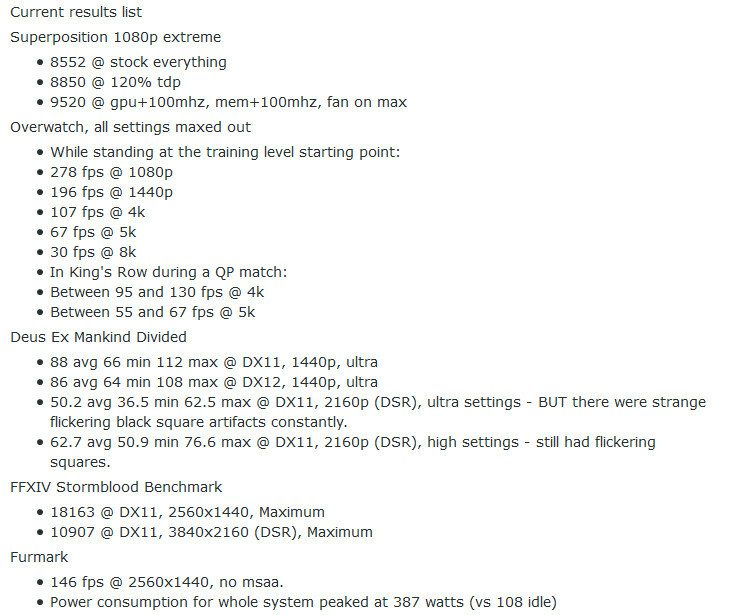 My own testing with 1080Ti shows that it is already often enough CPU-limted at 1440p, especially at high FPS, for example on 144/165Hz gaming monitor. Now, it would be really interesting to see a comprehensive set of Titan V benchmarks vs 1080Ti and on both AMD and Intel CPUs - i7 8700K and R7 1800X. 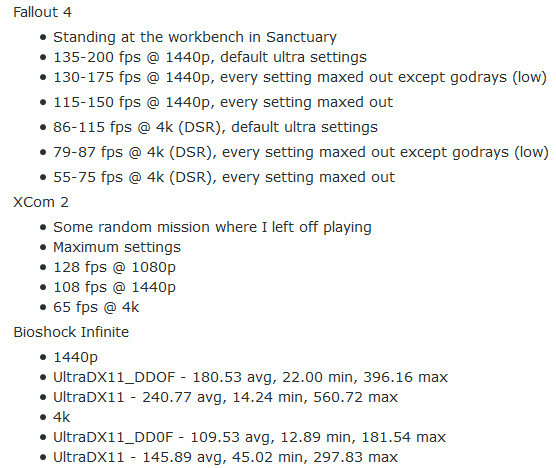 Will even more raised GPU ceiling allow more cores spread their wings or is pure clock speed still what you would want. Again, this still isn't the full GV100, even the PCI Tesla version which has higher cache and the full 4096bit memory interface isn't fully enabled. It's not too surprising considering its a 815mm2 chip. As for whatever replaces the current lineup, history tells us the 80 non-Ti replacement should still beat the 1080 Ti. I know that, but I'm not seeing they bringing more to consumer market since this is 3000$. The 1080Ti replacement will be faster no doubt, but the question is with how much. The price will just be a reflection of what it offers in the compute space, nothing else comes close for the money. Maxwell->Pascal was a 28->16nm transition forced by TSMC who couldn't deliver with their 20nm node. You should never expect such a large leap again. Nor use that copmarison as a reference. My thoughts exactly. 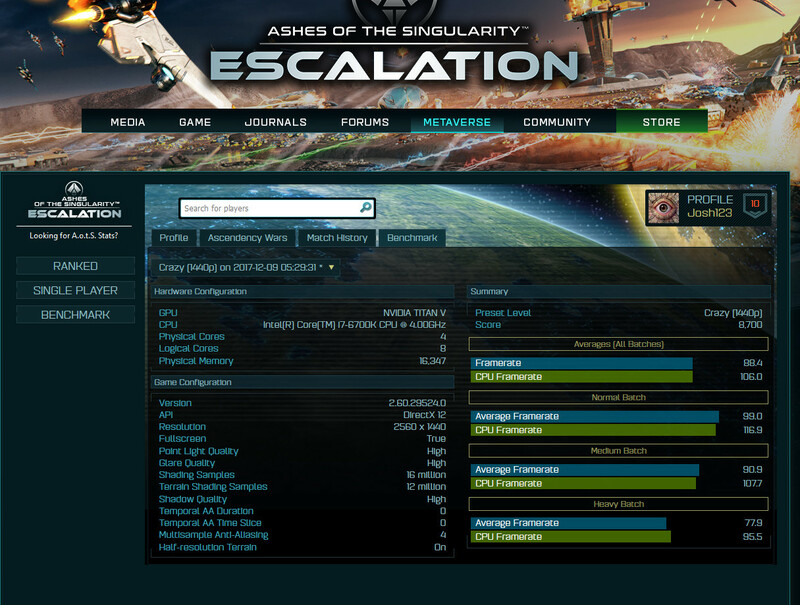 Let's say differnece is 35% in games (cpu limitation), even then for the corecount increase performance difference is way too small. 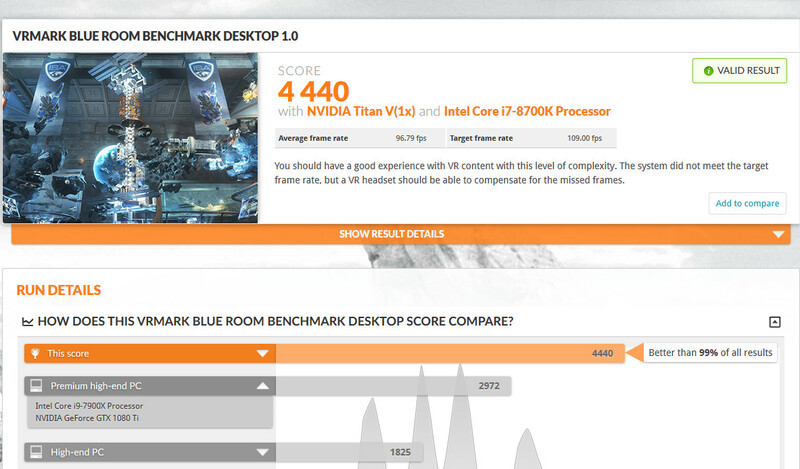 At best we'll see 40% difference after driver updates and with gaming clockspeeds. Volta is just not a gaming architecture, so I wouldn't be surprised if nvidia skip volta for geforce. 2080 is now probably only slightly faster or even a bit slower than 1080 ti if Volta is used, so everyone would just get the cheaper 1080 ti's. I think he means that if nvidia optimized volta for gaming rather than general computing and that would become ampere, it could be pretty amazing! Love the new techpowerup forum skin btw! The Titan Volta is not a gaming card. Indeed, It handles double precision better than my 980 Ti does single. It wont. They can only disable/enable the cores and not exchange one for the other. Not without creating another chip from the ground up , which I doubt they'll do. 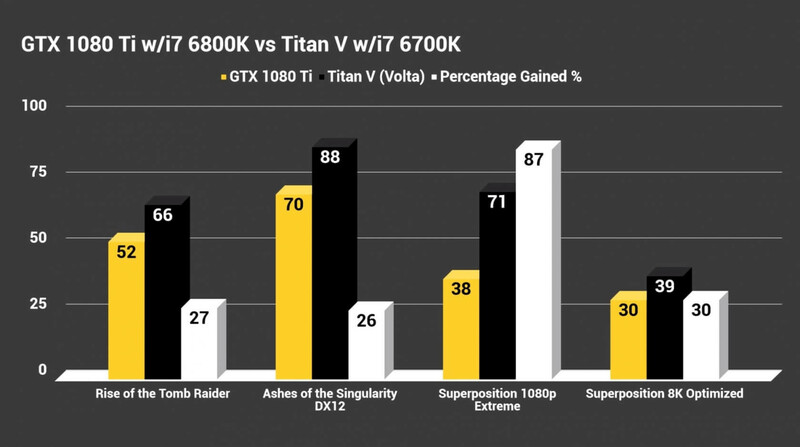 And the reason it is compared vs 1080Ti and not Titan is? "not gaming" Titan Volta is called Tesla V100. As they say, the most advanced data center GPU ever built. People are welcome to game with it, it seems to do pretty well. But Nvidia can afford to create dedicated consumer focused GPUs. I highly doubt since AMD is doing mistake after mistake and not making any step forward to rival nVidia. Remember the transition from Kepler to Maxwell ? They removed the FP64 capability but they didn't make up for it in terms of FP32 performance. If you remember the GTX 980 was barley faster than a 780ti. In addition , that was a transition from one architecture to another , they can easily afford to do that. Now they would have to re-engineering an already existing 800 mm^2 die. That's just simply not worth it , not matter how much cash they have. Of course they won't, they don't need to. 1080 Ti has no competition as you say. Gv100 powers supercomputers like Summit and is for research institutions. All else is tears in the rain.